The hub page is updated with the 88-Keys track link and also the first clue fror Poster 10. There appear to be some sweaters beside the words, and Melrose is a shopping area in LA. There is also a Melrose Avenue in Tokyo, and Melrose is the name of a clothing store with several branches around the US. Thanks to JPL for letting us know first about the clue. A new clue to get our teeth into. I've got to get ready for work, but I'll be back in a short while with some, hopefully useful, input. true, I've been following here since poster three -under a different name- and this seems most similar the the Dhamrma Van reveal thus far, what with the word/imagery/possible intersection combination. What about two streets? 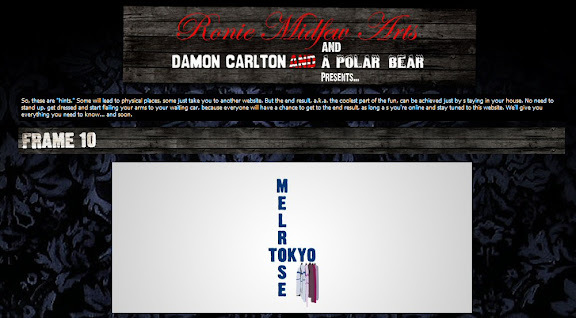 Is there a Melrose street next to a Tokyo one somewhere? I searched on Google but the only thing I could find that was close to that was Melrose Ave and Little Tokyo in LA, but that´s all. Would they jump from America to Asia for the next reveal? that would be interesting time-wise, hope I´m awake, lol (yeah I know, too soon to reveal the name of the next city if there´s one so it prob isn´t that). There are quite a few theories at the end of the comments on the previous thread. I haven't gone through them all myself yet. Haven't yet found any connection to "Tokyo" with this but there is a clothing store called "Crossroads Trading Company" on 7409 Melrose Ave. I'm outside USA, so have to rely on the words on its own website: it's a store for "recycled fashion". And there are branches over various US cities, including Portland Oregon. The Gallery 1988 / Jensen Carp connection was discussed quite a while ago (when DCaaPB was still in its former incarnation as a blog), so it's a bit difficult for me to dig up the specific forum discussion thread about that. But it's worthwhile to look at Gallery 1988's official blogs, as well as its "crazy4pop" exhibition. Jensen could also be found on Twitter. @justanothersky, that looks good, the only Tokyo connection I can see is Little Tokyo, but as someone said above the clue would probably have been a "little Tokyo"
I am definitely on board with the Bathing Ape theory, I think it definitely is in line with the recent partners DCaaPB have been doing reveals with i.e. trendy and interested in doing something cool and unusual. I'm new to BAPE but learning fast. I agree with whoever said that we should pay attention to the fact that the words are written the way they are. Similar to the Crumbs clue. Yes definitely a crossover of some sort, but is it a physical one or a fusion of ideas ? They have a store on Greene Street, Amy Lynn. This is the address fro the BAPE store in Tokyo. I guess it's really hard to find. It's a silver/gray building with stairs leading down to the store. I still think it could be both, the clue Melrose / JINGUMAE SHIBUYA-KU might have been too odd ! Oh right. Would of been cool if it was a 2 store/nation reveal, like the crumbs one but more international. Haha, just noticed that it says Tokyo Rose. Isn't that what Sawyer called Sun? If the URL is on clothing again - the people who turn up will be in for a great giveaway they are superexpensive! It seems too easy somehow - hope we aren't being led astray by a red herring but it all seems to fit. As soon as someone mentioned it on the other thread i thought it seemed like a logical collaboration. The stores are all designed by really famous people and so maybe it will be a display or something similar??! Two store reveal would definitely be interesting, considering the time zones. OMG, LostinLondon, if this is BAPELA, and they give away Lost-Shirts, there will be a stampede. Oh,no thorsten you misunderstood. If it is BAPE we are looking for I was just pointing out the Tokyo connectiion. I was having a hard time finding out if there actually was a BAPE in Tokyo. I knew there were stores in Japan as well as around the world. thorsten, it's unlikely that they'd be at the same time though. It's currently 10:20 pm Monday night in Tokyo, 6:21 am Monday morning in LA. There are actually three BAPE stores in Tokyo. The Harajuku store mentioned by Sayid'sgirl, but also the Shibuya store and one called BAPExculsive. Also, of the 25 stores listed on their website, all but six are in Japan. Lastly, I should point out that the reveal clues and/or locations have traditionally had nothing to do with the artist, nor with the subject of the print. jeremy, excellent point. I don't think we should even speculate on the artist, lest we create another situation like the last one. Morning all. Can someone call Tyson and tell him that the correct spelling of 88-Keys might be important? Tks. If we start sharing information in hexadecimal, binary or other encryption, "they" will never figure out what we are talking about. Oh, and neither would I. Looks like Tyson has gone back to his old ways revealing place first. I like that. I always gave me hope for a reveal in hometown. But, I think we see that Tyson is a bit of a home body and LA seems the likely location again. No letter from Andy? Maybe today. Yes the first purchaser letter has normally turned up by now. I hope we will get a look at it or at least someone tells us the relevenat information from it. I would be a shame if someone not really interested in Lost didn't share it with us. Maybe this is too obvious, but Gallery 1988 (http://www.nineteeneightyeight.com/entry/entry.html) is located on Melrose Ave. They don't sell clothes, however. Perhaps Jensen is branching out. Dr. Mum on the Dark UFO forum found a photo of Pete Wentz at the opening of the BAPE store in Los Angeles. That seems like a pretty good connection to me! Yes it does sound more and more likely. Jensen from Gallery 1988 probably knows the store owners, as they are so close. So.. I just noticed the return addy for Tyson is on a Melrose. Happy Monday! I just posted a short bit on the origins of "Tokyo Rose" over at DarkUFO. If you're interested, you can read it there! Return addy?? Gasp You returned a poster?? I like the BAPE thing, too. They are have a release of their catalog's Winter Collection on Oct. 20th! Maybe it's tied into that? posted my edition on the poster registry as well on darkufo. it's time for a new clue! Since Gallery 1988 is on Melrose, I googled the gallery name with Tokyo and came up with a poster called 'Fly to Tokyo' by Eric Tan, designed for the Beastie Boys. I forgot to add, the Fly to Tokyo poster has a robot on it. I think Pinkberry would be fun, but it's way off base. It's not a clothing store, and we've only had one or two reveals centered around characters, and those were way bigger ones than Frogurt. If KAWS did a poster, that would be insane. I'd love it to be Frogurt, but I can't see the link (yet). I'm prepared for an I told you so if I'm wrong. I'm surprised at the lack of subtlety in the first clue here. If it is BAPE then I might have expected something more like this. Got my hatch poster today. Has anyone put it under a black light yet? It looks like that kind of green. Mow I'm home from work, I just looked up KAWS and I'm very impressed. Amy Lynn, you could be right, maybe the delay in updating the site means that the original first clue was dropped for some reason. Mow I'm home, that doesn't even make sense ! Trial Attorneys, I haven't heard of anyone doing it yet. ReverendMilo has a good blacklight setup, but hasn't had the time yet. Most likely won't be kaws but we can dream, right? I'm guessing there could be something to the Gallery 1988 being as that it's on Melrose and their blog has a post about frame #9. Are we certain those are sweaters? I'm really thinking they're scarves. Also, a sign that I've been spending too much time thinking about this stuff: I had a dream last night about the next print being revealed. It was a dark night sky with a lit up little house below. I remember being confused by the print in my dream, and of course, I'm still confused awake. Maybe it was suppossed to be when we find out that Christian is Claire's father. I dunno. But it was a weird dream. 88-Keys – The Death of Adam"
Don't know if any has posted this, but The Crash has made it's way to eBay. Kinda makes me want to hurt someone. While I understand the stories about people having to sell them for financial reasons, why buy it in the first place? Sorry to sound like such a downer, but I would kill for The Hatch, but could never give someone the satisfaction of making $150 off a true lost fan. PS, got The Hatch in the mail today. It's incredible. Dang it - my neighbor just informed me the mailman passed and didn't leave a package. I just hope at the very least the first buyer was a Lost fan. I don't really understand the frustration of people selling their prints for a profit. I gladly paid a premium for The Smoke Monster print, since I didn't get one before it was sold out. Essentially, I feel I paid for that other person's time getting the poster when I wasn't available. If you missed one and wanted it desperately, wouldn't you be glad someone was selling theirs? I hope this doesn't sound too overbearing, but please don't start the whole debate over eBay sellers again. Right or wrong it has taken too much time out of the day to read all the comments. As Capcom says, lets just concentrate on the new clue and new posters and leave the resale market to itself for the moment. Has anyone figured out where the sweaters in the clue came from ? That is the one doubt I have about it being BAPE, as they don't really seem to fit in with the BAPE clothing line. The other question I have is have we discovered any correlation between clue release times and time zones ? The clue release times seem to be fairly consistent for each poster. I think Zort's right about the clue. It seems to me like we need to figure out where that image of the hanging sweaters originated. I looked all through the BAPE site, but I didn't see anything resembling that photo. I also tried picsearch.com this morning to find the image of the sweaters with no luck, but didn't spend that much time on it. Maybe I'll try some other avenues this evening. @ Dr. Bradley - There is a lot of evidence that Gallery 1988 is involved in the whole game, so I don't know that it's linked to this specific clue (except maybe that they know the folks at the store on Melrose since they're so close). This reminds me of the "LARCHMONT/WALL STREET" clue. I'm looking for a heart and crossbones in the next clue. If its there,, then I'll be okie dokie with tokidoki. I will say,,this clue has forced me to visit the L.A. fashion scene..well..somekind of scene..Its good to see the kids boldly going tho. I'd say our LA Lost ARGers need to get their schedules in order for Thursday/Friday. If anyone frequents Melrose Avenue, is there combined events calendar for businesses? All right nerds, here we go. So thanks to Yelp and it's Nearby feature, I found a place nearby both Gallery 1988 and Crossroads, called...Japan LA. It's on Fuller right off Melrose. Sells clothes, posters, toys, etc. Anything pop culture. 10-1 says that's it. I don't want to put a damper on all the Japanese-style goods at these stores on Melrose...but the sweaters hanging in the clue seem very conservative to me...very plain (except for a few stripes on the first ones) and very "un-trendy". Don't know if that means anything and the sweaters just represent clothes. FYI I got my hatch poster today, it looks fantastic!!! The lid was metal and a can opener did just the trick. Can't wait for the next print!! Is it possible that looking back 20 years from now that the ONE memory that will certainly NOT be forgotten is the various and sortied ways people have open THOSE tubes? andyschex reporting earlier in the day that he did not receive package from Tyson. What to make of that? But we are comforted by the knowledge that the roux was NOT burned and the gumbo delicious. I'll be over at Dark working on updating poster information. Please stop over and post as posters arrive. Let's get some Tyson prayers over at DCPB (Reverend's site) for direction and guidance. Still trying to meet the demands of the day, so popping out until midnight (CDT). The sun sets unseen. The door is left open. Right remains elusive. The ghosts of the piranha fade into the depths. Diner? The dog is trumped. Feet are forgotten. Now is NOW.Like a log, another tube makes a cord. The Hatch lays open before me. I'm envisioning a non-Lost fan opening a package and wondering "Why did I get a 6 inch, gold plated, octogan shaped necklace?" I just thought that the character-driven Japanese clothes, purses, etc. doesn't have anything to do with plain-looking sweaters. I saw some Tokidoki items at Macy's today and they are pretty wild! ..This whole.."jrock" and "jpop" is ..outside the box. Scarves are treated like kneckties.. on and on..Hello Kitty studded with diamonds..Pop is being imported from Japan. Its no longer the sole property of America. Pop.. like music..is becoming " world". BAPE is too rich for my blood. Anyway..Am I the only one who sees this clue clearly as MEL Rose To Knock You Out? Its sooo obvious. Maybe its a forest for the trees thing? Andy,,LOL!,,yea..something like,,jump suite? ?,,well now i got something to wear when i work on the car. Cap..loud and happy..yea..fascinating how the individuals at the Japan La party I think it was,, and a few other foto spreads on the jpop, how the individual played with the loud and happy. They are having fun. NEW CLUE....Same thing is now on a foliage background! Seems to be some brown leaves, too, and maybe some bark in the upper left? Ok...what the heck does this mean? CHICAGO!!!! The ivy covered wall at Wrigley Field? Is there a Melrose Store in Chicago? There are a lot of Melrose restaurants and diners in Chicago. I just saw that, James...it's mostly an industrial park. Maven, I thought of ivy as well! But then that makes me think of The Ivy which, I think, is on Melrose in LA. But that seems like it's too high profile. Well that explains the white background! Ummm...Melrose Park is a northwestern suburb of Chicago (not an industrial park). I guess the leafy background could indicate a park giving you Melrose + Park, but that still doesn't seem right to me. I found some pics of Wrigley Field and the ivy-covered wall looks very similar to the new background. Yeah the ivy outfield walls really look like the background they used, but I would think that any ivy wall would look like that. 1Miletogo: I like that idea, too! The store is covered in ivy! But the Tokyo connection alludes me for that store or the wall in Wrigley Field! Keep hope alive, Andy Schex. The last print was revealed late in the week. They probably haven't shipped the first to order prize until today, at the earliest. After the flood of orders, they may also have needed some extra time to verify who is really the first to order, under their new rules. And the postman probably won't be the one to bring a prize. The t-shirts sent to me came FedEx (so make sure you check your doors for those 'missed delivery' tags). On the other hand, NYC is a sister city of Tokyo. This is certainly Fred Segal's, Melrose Ave. I am looking for ivy used as background for link. LotteryTicket -- Fred Segals is a good catch...hmmm would they open a store in Tokyo? But there are references to many of the buildings on Melrose in LA having ivy covered walls. which says the photo was taken in Sweden. Maybe a bit of a dead end. Little Tokyo is to the east of Melrose Ave LA, not sure if that means anything though. This made me think of "Tokyo Rose." japanese streetwear with a twist: actually a japanese one. fashion designer yoshiyuki ogata is a, one might say critical, protagonist of japanese culture. he finds plenty of inspiration on home turf and injects many a striking element in the designs of his yoshiyuki label. his awesome a/w 09 collection is inspired by the country’s sengoku period [1467-1617] and is available at fred segal [los angeles] and the yoshiyuki flagship store in tokyo. flagship location: 5-17-8 jingumae [harajuku]. Harajuku style is the name of street fashion trends that emerge from the Harajuku Station district in Tokyo, Japan. Follow these steps to dress in Harajuku style. Our old friend "The Cobra Snake" is showing up some of my searches. ..due to the way the clues are unfolding...i get a sense of destination being " between"..The depth gives me that. The IVY Restaurant,,Little Tokyo,,MELrose,,seems a zeroing in may be in play.. I've been combing through the Fred Segal site, but it's late, and I'm not seeing a connection to Tokyo or a picture to match those sweaters/scarves/jackets/whatever. Maybe someone else will have some luck. waffle: I didn't find anything on the Fred Segal site that relates to the hanging sweaters or Tokyo. LT's story about a Japanese designer that is carried by the store might be the closest thing...what with the designer having a store in Tokyo. I have found nothing to tie in with the sweaters and Tokyo near Wrigley Field and Chicago...although there are many Melrose restaurants and diners. maven..what is across the street from the Ivy Restaurant on melrose? BTW: The Ivy is on Robertson...not near Melrose! The Ivy is on Robertson, south of Beverly (further south of Melrose). Google street view has Kitson near/accross from The Ivy, and Cedars Sinai. Probably neither are related. Kitson is a clothing retailer, but don't think it's related. Small detail: the shrubby, ivy background isn't a single complete image - there's at least one step and repeat in there. Im not sure if it is anything but the title of the picture of the ivy wall is "green and redish ivy covering red brick wall". Maybe it has something to do with being behind a brick wall or covering something. You guys clearly aren't shoppers! The background is the Vine wall from Fred Segal on Melrose. I am assuming the RH alludes to the Ron Herman boutique, which is located inside Fred Segal.